March 18th to 22nd, in the framework of a partnership program with the Fletcher School of Law and Diplomacy, MGIMO hosted a second joint educational module. During the week, 28 students from the two universities worked on projects dedicated to strategic stability and climate change issues. A similar module was held in March 2018 and was devoted to information security and the situation on the Korean Peninsula. In 2019, the students prepared reports on global nuclear stability and how to mitigate the effects of climate change. March 22nd, the groups presented their reports to the Russian Foreign Ministry, the U. S. Embassy in Moscow, and an MGIMO expert group headed by the Vice-Rector for Graduate and International Programs Andrey Baykov. The program aimed at deepening mutual understanding between the students of MGIMO and the Fletcher School by exchanging opinions on current issues on the international agenda. Throughout the week, leading Russian experts from MGIMO spoke to the students; among them Sergey Vasilyev, the Director of MGIMO’s Odintsovo campus, and representatives of the School of International Relations, the Department of Applied International Analysis, the International Law School and others. A number of external experts partook in some modules, including the Minister-Counsellor of the U. S. Embassy in Moscow, Thomas Leary, the Director of the Yu. A. Izrael Institute of Global Climate and Ecology Anna Romanovskaya, the Director of the Environmental Investment Center Mikhail Yulkin, the Director of the PIR Center Albert Zulkharneev, the Program Director of the PIR Center Adlan Margoev and representatives of Moscow State University. 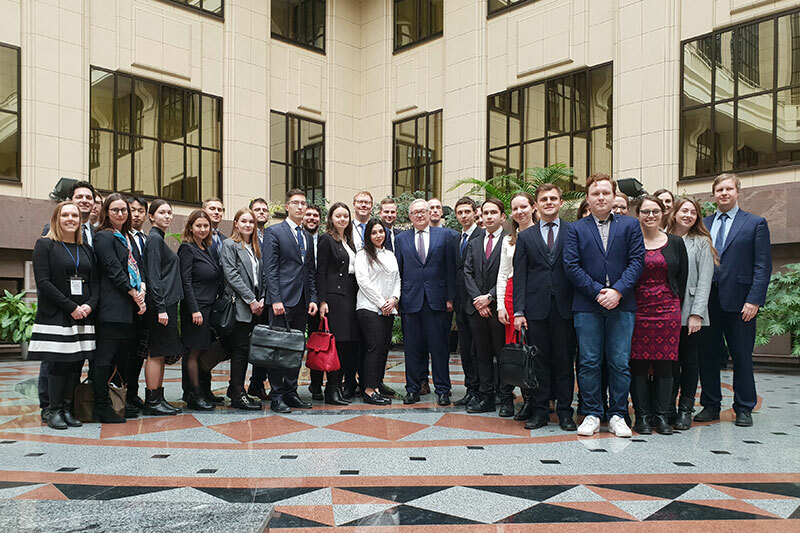 The students also participated in an expert discussion at the Valdai Club, went on a visit of the Russian Foreign Ministry and presented their findings and policy recommendations to Deputy Foreign Minister Sergey Ryabkov, and to the U. S. Ambassador to Russia Jon Huntsman. Since 2017, MGIMO has been implementing an extensive cooperation program with The Fletcher School of Law and Diplomacy (Tufts University, USA). The Fletcher School is the oldest in the United States and one of the most respected centers for international affairs studies and research in the world.